While most appellate practitioners are aware of Florida’s mandatory electronic filing (“e-filing”) and service (“e-service”) procedures, there are important differences between the two e-filing applications used by the appellate courts. By understanding these differences and investing a little more time up-front, practitioners can save substantial time and resources in the long run. In 2012, the Florida Supreme Court issued two highly anticipated opinions adopting recommendations to implement mandatory e-filing and e-service procedures in Florida.1 Intended to provide practitioners with access to “a fully electronic court system” with “increase[d] efficiency,” the new and amended Florida Rules of Judicial Administration – which became mandatory on staggered dates throughout 2012 and 2013 – require attorneys, with limited exceptions, to file case-related documents with the trial and appellate courts by electronic means, as well as to serve those documents on other parties by e-mail.2 These rules of court certainly are deserving of great praise for allowing the Florida courts and practitioners to efficiently operate “in an electronic environment.”3 Nevertheless, appellate practitioners – who frequently are tasked with e-filing and e-serving voluminous record-based materials – must sometimes undertake the process of e- ling documents with the appellate court in one le size, and then e-serving those same documents on other parties in smaller, broken down le sizes, to properly comply with the differing file-size restrictions imposed by the rules and the appellate courts. And oftentimes, this electronic file-and-serve protocol can become a cumbersome and time-consuming process that appellate practitioners should, but often do not, take into account. In their current forms, Florida Rules of Judicial Administration 2.516(b)(1) (E)(iv) and 2.525(d)(5) set forth differing maximum le-size requirements for e-serving and e-filing documents, respectively. Rule 2.516(b)(1)(E)(iv), a provision of the e-service rule, is mandatory and states that “[a]ny e-mail which, together with its attached documents, exceeds five megabytes (5MB) in size, must be divided and sent as separate e-mails, no one of which may exceed 5MB in size and each of which must be sequentially numbered in the subject line.” Rule 2.525(d)(5), a provision of the e-filing rule, on the other hand, is permissive in nature and actually reads as an exception to the e- ling requirement. That rule provides that “when the filing involves documents in excess of 25 megabytes (25MB) in size,” those “documents may be transmitted using an electronic storage medium that the clerk has the ability to accept, which may include a CD-ROM, ash drive, or similar storage media.” When read together, the e-service and e-filing rules have the potential to create additional, and perhaps unintentional, burdens on attorneys: e-filing case-related documents that have large file sizes, only to be met with the requirement of breaking down those large les into separate 5MB increments and then e-serving each of those broken down pieces upon the parties in multiple e-mails, requiring the e-mail recipient to, in turn, put those pieces back together to make that file whole again. How does this happen? To begin with, as of January 2015, Florida’s appellate courts currently use two different web-based, e-ling applications – the ePortal and the eDCA – depend-filing upon the court before which one is practicing (although at least one article has indicated that all Florida appellate courts are expected to begin accepting lings through the ePortal in the future).4 The ePortal services the Florida Supreme Court and the Second District Court of Appeal, and the eDCA services the remaining appellate courts: the First, Third, Fourth, and Fifth District Courts of Appeal. Both e-filing applications are built to accept submissions that are 25MB or larger. In terms of document le size, the eDCA has a slight advantage over the ePortal. Except for the Third District’s current eDCA application, which limits uploads to 25MB per submission, every court using the eDCA has no document-size restriction per submission. The ePortal, by contrast, is similar to the Third District’s eDCA, in that it limits the aggregate size of document uploads to 25MB per submission. Practically speaking, practitioners who wish to file something such as an appendix that exceeds 25MB could file the document as one le in the First, Fourth, and Fifth District Courts of Appeal, but would have to take the extra steps of separating that large document into multiple document submissions, each at or under 25MB, when e-filing it in the Florida Supreme Court and the Second and Third District Courts of Appeal. Although, in this latter scenario, Florida Rule of Administration 2.525(d)(5) does provide attorneys with the alternative of transmitting documents that exceed 25MB to the court “using an electronic storage medium that the clerk has the ability to accept,” such as “a CD-ROM, ash drive, or similar storage medium,” in the authors’ experience, most attorneys choose instead to go through the time-consuming process of filing large documents via multiple submissions – unless the appellate proceeding (non-final appeals, petitions for writs of certiorari, and the like) involves a large record that a litigant must file directly with the appellate court. Yet, even when it comes to multiple submissions of large documents, e-filing with the ePortal does have a major, time-saving bene t over e-filing with the eDCA: automated e-service. In contrast to the eDCA, which is not currently responsible for serving e-filed documents upon the parties to a case, the ePortal will undertake the task of e-serving documents uploaded to its database. And the ePortal application does not stop there: it also automatically breaks down documents into 5MB-per-e-mail increments in order to comply with Rule 2.516. Indeed, Rule 2.516(b)(1) expressly recognizes that practitioners can rely on the ePortal’s automated e-service system as a process that constitutes service under the Rule’s e-mail service requirement. The eDCA, however, has no such automation and cannot be used as a substitute for service. In other words, once a document is e- led with the eDCA, practitioners must themselves undertake the process of breaking down a large document into 5MB increments and then e-serving that document upon the parties one e-mail at a time, in order to comply with Rule 2.516’s e-service requirements. The only alternative to this cumbersome method of e-service is for the attorney to stipulate with the other party or par- ties that another form of service, out- side of e-mail, is suitable.5 Alternative forms of service may include delivery upon the parties of an electronic storage medium, like a CD-ROM or ash drive. But keep in mind that employing alternative methods of service, too, can be a time-consuming process. Until the time comes when all of Florida’s appellate courts accept l-filings through the ePortal, the lesson to learn is that appellate practitioners should make sure they understand the important differences between the ePortal and the eDCA before they choose to e-file, and then e-serve, large documents that ultimately will require a breakdown in order to comply with the Florida Rules of Judicial Administration. Nevertheless, whether e-filing through the ePortal or the eDCA, it would be wise to build extra time into the preparation process that provides peace of mind when breaking down large documents one plans to e-file and later e-serve. And this is particularly relevant now more than ever, as the Florida Supreme Court recently has amended the Florida Rules of Judicial Administration to require that all electronic files “be filed in a format capable of being electronically searched, ”6 adding another layer of time commitment to the e-filing process. Practitioners should also consult the appellate courts’ local rules and administrative orders for further guidance. Those who do will benefit from greater efficiency and effectiveness. 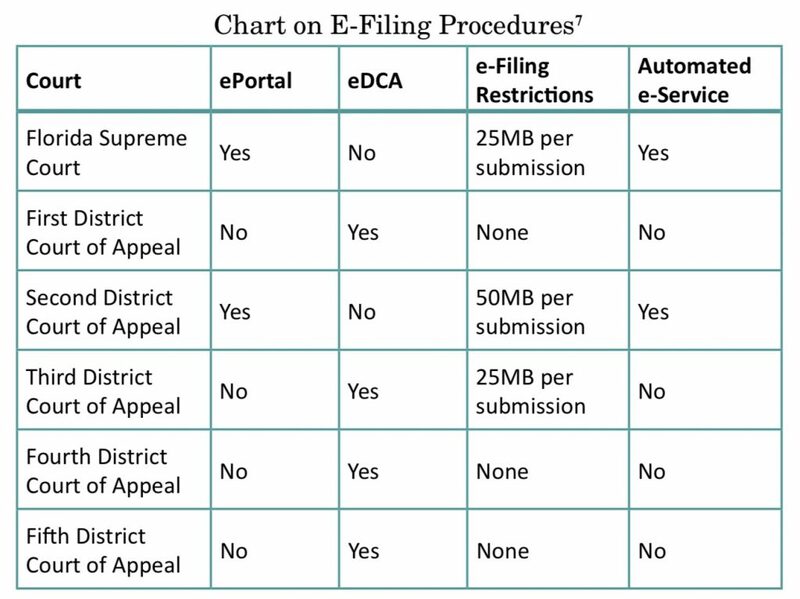 Chart on E-Filing Procedures – Much of the information conveyed here was obtained from the clerks of the various appellate courts. Jay A. Yagoda is an associate and Brigid F. Cech Samole is a share-holder in the Appellate Practice Group of the international law firm, Greenberg Traurig. They may be reached at yagodaj@gtlaw.com or cechsamoleb@gtlaw.com. In re Amends. to Fla. R. Jud. Admin., Fla. R. Civ. P., Fla. R. of Crim. P., Fla. Prob. R., Fla. R. Traff. Ct., Fla. Sm. Cl. R., Fla. R. Juv. P., Fla. R. App. P., Fla. Fam. L. R. P.— E-Mail Serv. R., 102 So. 3d 505 (Fla. 2012); In re Amends. to Fla. R. Civ. P., Fla. R. Jud. Admin., Fla. R. of Crim. P., Fla. Prob. R., Fla. Sm. Cl. R., Fla. R. Juv. P., Fla. R. App. P., & Fla. Fam. L. R. P.—Elec. Filing (E-Filing Amends. ), 102 So. 3d 451 (Fla. 2012). E-Filing Amends., 102 So. 3d at 452-54. Id. at 452. Fla. R. Jud. Amin. 2.516(b)(1). See In re Amends. to Fla. R. Jud. Admin. 2.520, No. SC14-721, 2014 WL 6675417, at *1 (Fla. Nov. 26, 2014). This amendment went into effect on January 1, 2015. Id.